Germany has strict laws about the use of Nazi imagery, and who could blame it? That means that until now, video games containing Nazi symbolism or characters could not be sold in the country. Last month, the Entertainment Software Self-Regulation Body (USK) announced that this decision would be reversed in cases where the Nazi representation is in an artistic or scientific purpose, or in a historical content. Today, the first decision has been made to reverse previous ruling for a PC game... and that means Attentat 1942 can finally be released in Germany. Attentat 1942 isn't your common video game. It has a heavy background in education, being developed by Charles University and the Czech Academy of Sciences, and with the support of the Czech Ministry of Culture and the Technology Agency of the Czech Republic. It's supposed to be incredible historically accurate, but despite winning awards in Germany it remained unavailable to release due to the Nazi symbolism contained within. The game was released to critical success nearly a year ago (October 2017), worldwide minus Germany. It didn't even matter that the game was entirely based on professional historians' research. But with the USK's rule changes, it can now evaluate each game containing unconstitutional Nazi imagery for its "social adequacy." Not only will it be available in the country, but it will be released with German subtitles. 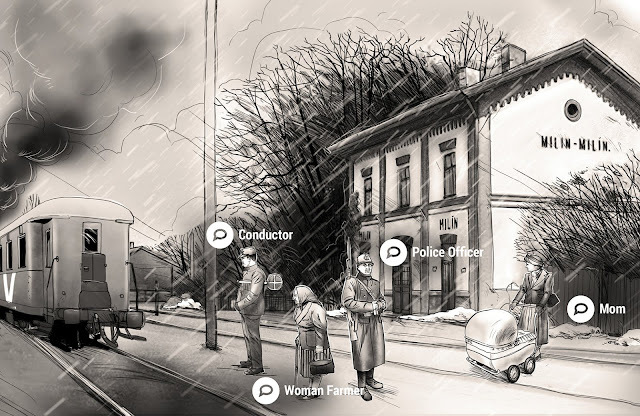 Combining interactive comics, video interviews, and archival footage, the narrative Attentat 1942 is told through Czech survivors of the war. "Attentat 1942 shows the profound impact that the war and the Nazi totalitarian regime had on the lives and minds of ordinary people," says Vít Šisler, the game’s lead designer, via a press release. "It immerses players in the living histories of personal tragedy and pain as well as moments of extraordinary hope and courage." Other games that have been given ratings include the upcoming Through the Darkest of Times, and My Child Lebensborn. The latter is a mobile title you definitely need to check out now. As for Attentat 1942, it is available for PC and Mac via Steam of the Humble Store. This is history in the making in Germany, and possibly has worldwide repercussions. First, it means the German government it beginning to differentiate between Nazi propaganda and artistic or historic use of the associated symbols. Second, The government has decided, in legislation, that video games hold historic merit. That helps to further remove video games from a purely entertainment standpoint and begin to put certain titles into the non-fiction or even educational category.